BACKGROUND AND PURPOSE: MR imaging sheds new light on CNS involvement in the course of acquired chronic liver disease; however, the exact pathogenetic mechanisms of hepatic encephalopathy and associated MR abnormalities remain unclear. Our purpose was to relate MR signal intensity abnormalities of the CNS to clinical, biochemical, and pathologic features of childhood-onset chronic liver disease. METHODS: Twenty-one patients (12 male and nine female patients) were included in the study; two had Crigler-Najjar disease type 2, 17 had chronic liver disease of different causes, and two had idiopathic copper toxicosis. Twelve patients had histologically proved liver cirrhosis, with a median disease duration of 175 months at the time of MR study. None had clinical symptoms of hepatic encephalopathy. MR imaging was performed using spin-echo T1- and T2-weighted sequences. RESULTS: Eleven patients had abnormal MR imaging findings of the brain revealed by T1-weighted MR sequences; two of the 11 had idiopathic copper toxicosis. The affected sites were the hypothalamus and globus pallidus, presenting symmetrical and bilateral high signal intensities, or the pituitary gland, which appeared homogeneously hyperintense, or both findings. Eight of the 12 patients with cirrhosis had abnormal MR signals of the brain. In these, the median cirrhosis duration was shorter (169 months) than in the remaining four patients with normal MR signals (177 months). A significant correlation was found between abnormal MR signals of the brain and cirrhosis (P = .008) and factor V activity (P = .008). CONCLUSION: MR imaging confirms the presence of abnormal brain signals in the globus pallidus, hypothalamus, and pituitary gland in patients with childhood-onset liver disease in the absence of clinical symptoms of encephalopathy. Signal intensity abnormalities are likely caused by an as yet unidentified metabolic process partially correlated with the severity of liver disease. MR imaging sheds new light on CNS involvement in the course of acquired chronic liver disease (1−5). In particular, T1 hyperintensity in the globus pallidus has been reported in 50% to 75% of patients with advanced liver disease of different causes, mainly adults with alcoholic cirrhosis (3, 4, 6−13). The exact mechanism of hepatic encephalopathy and abnormal MR findings is not clear, and the pathogenesis remains unknown. These issues have been addressed systematically in adult patients but only occasionally in pediatric patients (9, 14). In the present study, we performed a quantitative MR analysis of the brain by using spin-echo T1- and T2-weighted sequences. The goal was to determine the frequency, sites, and patterns of CNS involvement in patients with childhood-onset liver disease of different causes, mainly inherited, and to find any correlations with liver function, disease duration, and severity. A retrospective analysis of the consecutive MR findings of the brain of 21 patients (12 male and nine female patients) who were followed up in our pediatric department, gastroenterology section, was performed. Two patients had Crigler-Najjar disease type 2, and 17 had chronic liver disease of different causes. The two remaining patients had liver copper overload (idiopathic copper toxicosis) (15). Patients 6 and 19 had central diabetes insipidus. Table 1 presents the clinical details of the patients. Twelve patients (patients 2, 4−6, 8−13, 20, and 21) had histologically proved cirrhosis. According to the Child-Pugh classification (16), the cases were graded as A (score, 5−6), B (score, 7−9), or C (score, 10−15), reflecting mild, moderate, or severe liver disease, respectively. Twelve cases were classified as grade A and the remaining nine as grade B. The biochemical parameters of liver disease activity and function, such as alanine aminotransferase, aspartate aminotransferase, gamma-glutamyltranspeptidase, albumin, factor V activity, prothrombin, bile acids, total serum, and conjugated serum bilirubin, were evaluated at the time of MR study (Table 2). The median patient age at the time of diagnosis was 6 months (6 months for the patients affected by chronic liver disease and 82.5 months for those with idiopathic copper toxicosis). At the time of the study, the median patient age was 153 months (157 months for those with chronic liver disease and 96.5 months for those with idiopathic copper toxicosis). At the time of MR study, the median age was 175 months for patients with cirrhosis and 97 months for the others. The median of disease duration at the time of MR study was 124 months for patients with chronic liver disease and 14 months for those with copper liver overload. Patients with cirrhosis were studied with MR imaging after a median of 149.5 months from the time of diagnosis, and those without evidence of cirrhosis were studied after 60 months. No clinical signs of hepatic encephalopathy were documented. A neurologic examination revealed that peripheral neuropathy secondary to vitamin E deficit was present in patient 13. Sudden death (which may be atrributable to a cerebral vascular event) occurred in patient 13 while she was waiting for liver transplantation, and two patients died because of complications after (patient 6) and during (patient 12) liver transplantation. All patients were studied with MR imaging using a Magnetom SP (Siemens, Erlangen, Germany) 1.5-T tomograph. A spin-echo T1-weighted sequence was performed using the following parameters: 310−400/15 (TR/TE); number of acquisitions, three; section thickness, 4 mm; field of view, 200 mm; matrix size, 256 × 256 pixels; acquisition time, from 4 minutes to 5 minutes 10 seconds. Coronal sections were obtained of 20 patients (patients 1−19 and 21), sagittal sections of 16 patients (patients 2−9, 11−14, 16, 18, 19, and 21), and transverse sections of three patients (patients 10, 16, and 20). A spin-echo sequence with double-echo proton density–and T2-weighted (2500/20.80; number of acquisitions, one; section thickness, 4 mm in the transverse and coronal planes; matrix size, 256 × 256; field of view, 220 mm; acquisition time, 10 minutes 44 seconds) imaging was performed; coronal sections were obtained of 10 patients (patients 2, 4, 8−12, 14, 16, 18) and transverse sections of eight patients (patients 1, 3, 7, 15−17, 20, 21). The following anatomic sites were evaluated: cerebral and cerebellar white matter, basal ganglia, hypothalamus, thalamus, midbrain, and pons. The images were reviewed by two independent examiners (E.G., M.M.). The precise location of any abnormality was recorded for each patient, and the signal intensity of the brain structures was determined visually and was defined as normal or hyperintense by comparing the signal with that of adjacent normal brain structures. Both examiners viewed the images together and reached a consensus on the grading of each case. The quantitative analysis of the lesions with the region-of-interest system was not reliable because the lesions were not homogeneous. Group comparisons were conducted using the χ2 test. Linear correlation was used to determine any relationship among MR findings, biochemical parameters of liver function, disease duration, and cirrhosis. Statistical significance was assigned to any probability value less than .05. Eleven patients had abnormal CNS findings on their T1-weighted MR images; nine of them had chronic liver disease (patients 3, 5, 6, 9, 10, 12, 13, 15, and 19), and two had liver copper overload (patients 20 and 21). The affected sites were the globus pallidus and contiguous internal capsule in the hypothalamus or the anterior pituitary gland or both findings. The abnormal finding at the hypothalamus and globus pallidus consisted of high symmetrical and bilateral signal intensities of various extent (Figs 1A and 2A), whereas the pituitary gland was homogeneously hyperintense; “white pituitary gland” prevented the distinction of the usual isointense anterior pituitary signal from the normal hyperintense posterior pituitary signal (Fig 3). No abnormalities in signal intensity were revealed by spin-echo proton density–T2-weighted MR images (Figs 1B and 2B). Images of patient 10 with biliary atresia. A, Coronal spin-echo T1-weighted image shows symmetrical and bilateral hyperintensity at the level of the globus pallidus and hypothalamus (arrows). B, No evidence of abnormal signal intensity is seen on the coronal spin-echo T2-weighted image. Images of patient 20 with idiopathic copper toxicosis. 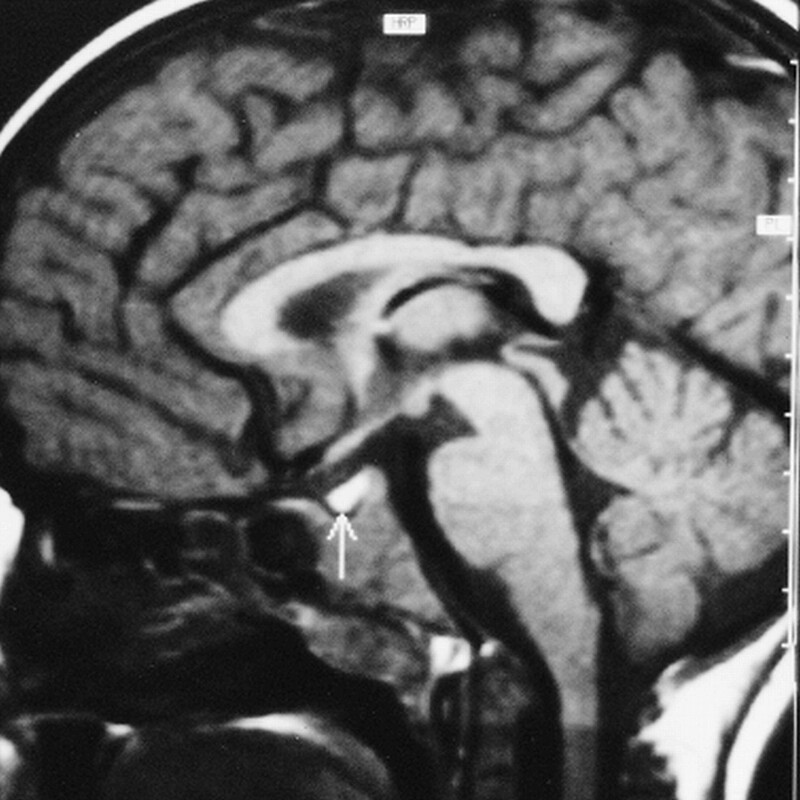 A, Axial spin-echo T1-weighted image shows symmetrical and bilateral hyperintensity at the level of the globus pallidus and hypothalamus (arrows). B, No evidence of abnormal signal intensity is seen on the axial spin echo T2-weighted image. Eight patients with abnormal MR signals had cirrhosis, and four patients with normal MR signals had cirrhosis. A significant inverse correlation was found between cirrhosis, and albumin level (P = .002) and coagulation factor V activity (P = .0097); significant correlations were found also between abnormal MR signals of the brain, and cirrhosis (P = .008) and factor V activity (P = .008). The median disease duration for the patients with high MR signal intensity of the brain and cirrhosis was 130 months, whereas it was 160.5 months for those with normal MR signals of the brain and cirrhosis. No correlation was found with the serum alanine aminotransferase, aspartate aminotransferase, gamma-glutamyltranspeptidase, albumin, bile acids, total and conjugated bilirubin, and prothrombin activity. In this study of patients with childhood-onset liver disease, we found that MR imaging of CNS involvement is as common in pediatric patients as in adult patients (1, 3–5, 6–8, 13). Eleven (52%) of our patients had abnormal MR signals of the brain shown by spin-echo T1-weighted sequences. In particular, T1-weighted symmetrical and bilateral signal intensity of the globus pallidus and contiguous internal capsule of the hypothalamus was observed on the images of seven patients with chronic liver disease, independently of the type of liver disease, and on the images of the two patients with idiopathic copper toxicosis. Only sporadic pediatric cases with chronic liver disease and MR evaluation of the brain have been described (9, 14), which makes comparison with other studies difficult. The causes and mechanisms of the increased signal intensity remain unknown, although several hypotheses have been presented. The association of hyperintense signals of the brain and portal-systemic shunting (6, 13) suggests that brain deposition of paramagnetic substances may have a role in the pathogenesis of this signal. The T1-weighted hyperintensity caused by a paramagnetic substance usually shows a hypointense signal at T2 (1, 7). This was not mirrored in our patients; the documentation of T1-weighted hyperintensity was not accompanied by any T2 hypointense signal. This raises the question of the cause of the accumulated substance. Evidence of manganese accumulation at the basal ganglia and abnormal MR signals at the globus pallidus, putamen, caudate, substantia nigra, and mesencephalic tegmentum on the images of three patients with cirrhosis who died after liver failure (11) seem to strengthen the case for a causal role of this trace metal. Abnormal MR signals at the basal ganglia, however, have been documented for more than half of the children who had received long-term parenteral nutrition containing manganese leading to cholestasis (11), which indicates that liver dysfunction, rather than systemic-portal shunting, is the most important mechanism associated with brain abnormality. In the present study, the MR hyperintense signals of the brain correlated with the severity of liver disease and in particular with factor V activity. The lack of correlation with serum bile acids and bilirubin suggests that the final pathway responsible for the hyperintensity at the globus pallidus and contiguous internal capsule of the hypothalamus is not linked to the bile excretion mechanism. The heterogeneity of liver disease in one study, however, may also account for lack of statistical significance. The statistically significant inverse correlation between abnormal MR findings and factor V activity suggests that a value of less than 60% is a reliable marker highly predictive of brain imaging abnormalities in liver disease. The pituitary gland was, in our study, the second most commonly affected site shown on the MR images; it appeared homogeneously white in eight patients (38%), including the two patients with idiopathic copper toxicosis. It is worth noting that isolated pituitary involvement may occur, as in our patients with sclerosing cholangitis and with autoimmune hepatitis. This agrees with other reports of adult and pediatric patients (1, 14), indicating that the pituitary gland, globus pallidus, and contiguous internal capsule of the hypothalamus are the elective target for substance accumulation in chronic liver disease. The marked hyperintense signals of the pituitary gland makes it impossible to distinguish between the normal isointense anterior pituitary signal and the posterior pituitary hyperintensity, as in our two patients with central diabetes insipidus. The lack of bright posterior signal on MR images is known to be a reliable marker of central diabetes insipidus (17, 18). The MR findings of CNS involvement in cases of Wilson's disease are rather heterogeneous (1, 2, 19–21), the most common being the T2 signal hypointensity at the basal ganglia determined by the magnetic susceptibility of the copper accumulation (5, 21–23). Areas of signal hyperintensity have also been ascribed to edema, glioses, necrotic areas, and cystic degenerations or local ischemia (5, 20) rather than to the copper deposition. In our patients with idiopathic copper toxicosis, the different MR localizations of the brain at the hypothalamus, globus pallidus, and anterior pituitary lobe were identified using T1-weighted imaging. This suggests that, in these two diseases, not only the target organs but the accumulated substance may be different. In conclusion, abnormal T1-weighted MR imaging findings, principally on images obtained at the level of the globus pallidus, hypothalamus, and pituitary gland, are relatively common in cases of childhood-onset liver disease of different causes. These signal hyperintesnities are partially related to disease severity. The natural history of these brain abnormalities in cases of childhood-onset liver disease is not fully understood, and the precise significance for clinical prognosis remains controversial. It may well be that these hyperintensities appear earlier in pediatric cases than in adult cases and may represent a different entity with a different course. Although the presence of CNS hyperintensities was not associated with clinical signs of chronic hepatic encephalopathy in our patients, a subclinical disease cannot be entirely excluded. On the other hand, no adequate psychometric or neurophysiologic tests have been devised for diagnosing subclinical states in children. A role for substance accumulation at the pituitary gland in determining endocrine dysfunction, as in hemochromatosis, must be ruled out. ↵1 Address reprint requests to Eugenio Genovese, MD, Department of Radiology, University of Pavia, Istituto Policlinico S. Donato, Via Morandi, 30, I-20097 S. Donato Milanese (MI), Italy.